rusty pickle event this weekend! just a reminder and a synopsis of the events planned. friday, nov 30th 6pm to 9pm. create a unique treasure with kristan. kristan will help you record those special moments and traditions that you and your family celebrate each holiday. this album is perfect for a very special gift to a loved one. sat, dec 1st 10am to 1pm. 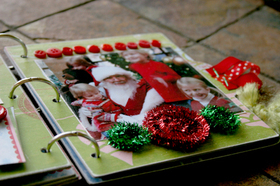 join me [candice] and create a chipboard album designed to showcase all those wonderful photos of santa visits. we'll play with templates, buttons, ribbons, stamps and more! sat, dec 1st 2pm to 5pm. 'tis the season. 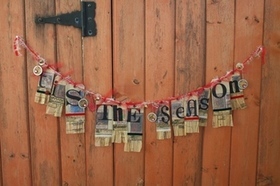 create a beautiful christmas banner with ann. 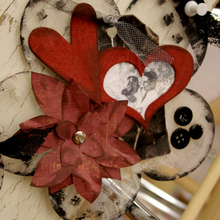 in this class, you'll play with the very popular rusty pickle random chipboard alphabet. ann is the queen of altered art! sat, dec 1st 6pm to midnight. CROP with the rusty pickle chefs! if you are participating in the altered paint can swap - please alter a paint can with at least 80% rusty pickle products (any theme) and bring to the crop to swap. the chefs will judge the top 3 designs and each of the 3 will receive a picklelicious rusty pickle goodie. throughout the night, we will offer some raffles to win some other pickle treats and the croppers will have the chance to do free M&T's with each chef - ann, candice, casey, kristan and tracey. that's right - 5 free M&T's. sun, dec 2nd 11am to 2pm. join casey and design a picklelicious creation! 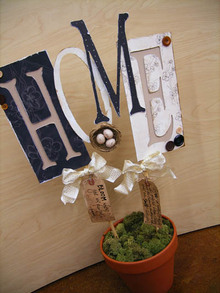 you'll transform the rusty pickle jumbo chipboard letters into a work of art. 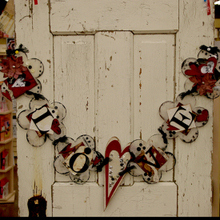 casey's project is perfect for your own home or for a great gift to a dear friend. sun, dec 2nd 3pm to 6pm. join the one and only LANCE ANDERSON for a brand new class. lance will help you transform the newest rusty pickle acrylic flower album into a show stopping swag. 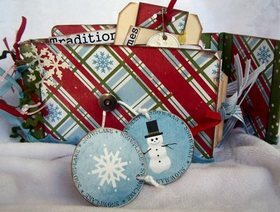 you'll play with paint, ink, patterned paper, cardstock tags, buttons, and chipboard. acrylic is the hottest trend in the market! be one of the first to experiment with this new medium. you can easily transform the swag into an album - 6 clear acrylic pages binded with one jump ring. 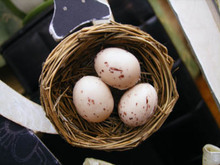 the classes are filling quickly - a few spots remaining. the crop is over half full so don't wait to call and reserve your spot today! call 760-433-9313 today! merry grinchmas to you all! BRAND NEW!!! using the brand new rusty pickle scalloped acrylic album, i designed an album for the upcoming holidays. i'll add my photographs and journaling later. the design is done and now i can add my memories when i have time to sit and reflect. a new process for me - i usually create an album around my photographs, but i thought i'd try something new. i'm teaching this album at cool scrapbook stuff in poway on saturday, december 8th from 2:30pm to 6:30pm - four hours of fun! we'll play with acrylics, ink, modge podge, embossing powders and different types of sheers - rusty pickle acrylic album, maya road sheer snowflake, hambly overlays, office supply tag - it's all about being CLEAR! hope to see y'all there! only 20 kits so call today to reserve your spot or to purchase your kit. kit comes with color photograph sketches and written instructions. 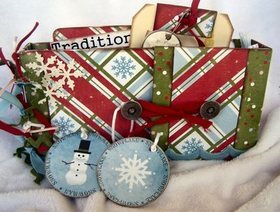 ingredients: rusty pickle scalloped acrylic album, rusty pickle pp, rusty pickle stamps, rusty pickle buttons, hambly overlay, hambly rub-ons, maya road sheer snowflake, catslife press stamps, embossing powder, acrylic paint, ink, felt, tule, ribbon, office supply name tag. just in time for the christmas photo/card. introducing the fitzpatrick family. visit [here] to see the entire fitzpatrick family gallery. here's a sneak peek of the rusty pickle class that lance will be teaching at ever after on sunday, december 2nd from 3pm to 6pm. call ever after today to reserve your spot or to purchase a kit - 760-433-9313. limited seats! you can see more info on the rusty pickle blog. ingredients: rusty pickle 6x6 acrylic flower album, rusty pickle chipboard - random alpha and hearts, rusty pickle princess bride and moulin rouge papers, rp buttons, transparency, lace, tule, sequins and acrylic paint. 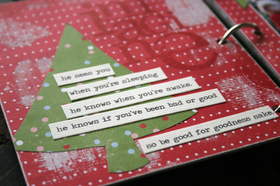 here are some sneak peeks at a NEW class i'm teaching at ever after scrapbooks on saturday, december 1st from 10am to 1pm. this class is part of the rusty pickle very merry grinchmas event at ever after which takes place from nov 30th through dec 2nd. five rusty pickle chefs including the pickle man himself - LANCE - will be teaching some fabulous classes just in time for the holiday gift giving season. *santa baby* this class is perfect to showcase your pictures and memories from visiting santa. 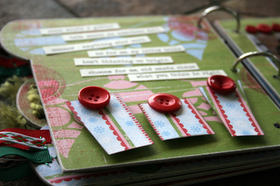 all the sayings are there for you to clip and use to embellish your album. i originally wanted to use all of the pictures of me as a little girl sitting on santa's lap, but i can't find my albums right now. after the ca fires, hubby helped unpack the cars and i have not been able to locate some things - they are somewhere just don't know where now. at any rate, the photos i chose to use for the album are of my little darlings from last year (2006) while we visited santa. we had so much fun! love visiting santa!!! i love this time of the year. i love the anticipation that builds as we grow closer and closer to december. it's a tradition in our home that we start decorating the day after thanksgiving. i've been doing this since i was a little girl. my mom would pull out the boxes upon boxes from the above attic, and just digging through all the ornaments and tinsel and garland was heaven. my mom baked cookies - my favorite - peanut butter cookies. the aroma of fresh baked cookies lingered in the air while christmas songs played in the background, and we'd hum along to the tunes. okay, enough gabbing... here are the peeks! i hope you enjoy them and i hope you are available to join me! christmas hugs!!! 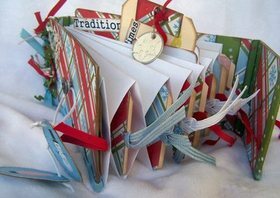 ingredients: rusty pickle tabbed chipboard album, rusty pickle christmas papers (2006 and 2007 lines), ribbons, fibers, stamps [rusty pickle, catslife, paper source, heidi swapp], acrylic paint, ink, transparency, cardstock words.